It's cowboys vs. dinosaurs in a film in which the background characters are often more heroic than the stars. Despite the fact that Weird Westerns are one of the more commonly made types of Western film — at this moment, they are probably the most commonly made type — they tend to be pretty obscure. They're a low-budget pleasure, made on the cheap and distributed to limited audiences, just as most Westerns have been throughout film history. As much as we would like to pretend that Westerns have enjoyed a critical evaluation, nobody is working their way through all 12 episodes of "Don Daredevil Rides Again," nor should they be expected to. And so it is that there aren't many Weird Westerns that are relatively well-known. "The Valley of Gwangi" from 1969 is one of them, at least in horror circles, thanks to it having been a never-filmed pet project of stop-motion pioneer master Willis O'Brien, who was responsible for "King Kong," and was inherited and filmed by his protege, Ray Harryhausen, who was undeniable one of the masters of stop-motion. Also, if you were a fan of the television show "Scarecrow and Mrs. King," "The Valley of Gwangi" was the only thing every playing on television on the show, for some reason. It is, alas, not all that its hype would have you hope it would be. 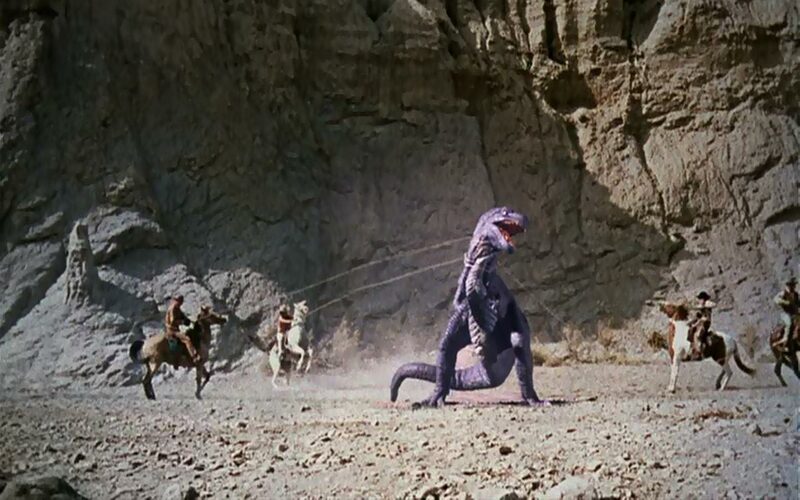 Despite the relative novelty of having a movie in which cowboys battle dinosaurs, even when it came out "Gwangi" felt like it was on well-trod ground, starting with a hidden, prehistoric valley, a la "The Lost World," which O'Brien had lensed in 1935, and culminating in a monster going on a rampage after being put on display, a la "King Kong," which O'Brien had lensed in 1933. Additionally, while Harryhausen had a superb talent for creating animated monsters that functioned like actors, demonstrating remarkable personality, that talent is not on display here. The monsters are weirdly colored (often purple) and strangely anonymous. They're less like Harryhausen monsters than like regular movie monsters, devoid of any real motivation beyond chomping and gnashing. These movies were always less about their casts than the undeniable spectacle of watching huge creatures smash up stuff, but even by those standards, the cast of "Gwangi" is somewhat unengaging. Star James Franciscus plays an unusual combination of cowboy and con-man, apparently traveling the world looking for opportunities to unfairly exploit. He's believable oily, but, then, do we really want our heroes to be bullying clip artists? He has an unpleasant albeit inadvertently hilarious habit of just running away from trouble, often leaving behind people who just helped him out, and this can't be accidental but neither is it especially heroic. He has a yen for a cowgirl who does a horse high-dive act, played by Israeli actress Gila Golan; unfortunately, her Israeli accent proved to be so strong that all of her dialogue was overdubbed and she immediately retired from acting. I'd like to see a cut of the film that uses her actual voice, just so I could include the film in the micro-genre of Western films I call Kugel Westerns, which feature Jewish characters. The film is not without its pleasures, small though they may be. There are, as an example, two plucky sidekicks who somehow manage to survive the entire film, both aw-shucks sorts of cowboys with big teeth and no evidence of intelligence. Their names are Rowdy and Bean and, without anybody else around who is willing to do it, they do the lion's share of the movies heroic deeds, often in the background and without credit. I'm tempted to watch the movie again and just focus on Rowdy and Bean, as though they were the actual main characters of the film, which I think they should have been. Also, the film's climax takes place in a Mexican cathedral, where a T.Rex is running amok, and features a pipe organ suddenly interrupting the action and saving the day, probably because Rowdy and Bean are outside and somebody needs to be the hero. My only complaint is that the scenes lacks something so essential I don't know why it was left out. As soon as the T. Rex broke into the cathedral, he should have been confronted by a priest holding a cross aloft. The priest should have cried out "This is a house of God, demon! You have no place here!" And then the T. Rex should have eaten him. That's how you make a dinosaur movie.